This image of the Eris simulation shows the stars in the galaxy as observers would see it. Blue colors are regions of recent star formation, while redder regions are associated with older stars. The spiral arms are typically star-forming, and the central bulge is basically "red and dead." Credit: J. Guedes and P. Madau. After nine months of number-crunching on a powerful supercomputer, a beautiful spiral galaxy matching our own Milky Way emerged from a computer simulation of the physics involved in galaxy formation and evolution. The simulation by researchers at the University of California, Santa Cruz, and the Institute for Theoretical Physics in Zurich solves a longstanding problem that had led some to question the prevailing cosmological model of the universe. "Previous efforts to form a massive disk galaxy like the Milky Way had failed, because the simulated galaxies ended up with huge central bulges compared to the size of the disk," said Javiera Guedes, who recently earned her Ph.D. in astronomy and astrophysics at UC Santa Cruz and is first author of a paper on the new simulation, called "Eris." The paper has been accepted for publication in the Astrophysical Journal. The Eris galaxy is a massive spiral galaxy with a central "bar" of bright stars and other structural properties consistent with galaxies like the Milky Way. Its brightness profile, bulge-to-disk ratio, stellar content, and other key features are all within the range of observations of the Milky Way and other galaxies of the same type. "We dissected the galaxy in many different ways to confirm that it fits with observations," Guedes said. According to coauthor Piero Madau, professor of astronomy and astrophysics at UC Santa Cruz, the project required a large investment of supercomputer time, including 1.4 million processor-hours on NASA's state-of-the-art Pleiades supercomputer, plus additional supporting simulations on supercomputers at UCSC and the Swiss National Supercomputing Center. "We took some risk spending a huge amount of supercomputer time to simulate a single galaxy with extra-high resolution," Madau said. The results support the prevailing "cold dark matter" theory, in which the evolution of structure in the universe is driven by the gravitational interactions of dark matter ("dark" because it can't be seen, and "cold" because the particles are moving slowly). Gravity acted initially on slight density fluctuations present shortly after the Big Bang, pulling together the first clumps of dark matter, which grew into larger and larger clumps through the hierarchical merging of smaller progenitors. The ordinary matter that forms stars and planets (less than 20 percent of the matter in the universe) has fallen into the "gravitational wells" created by large clumps of dark matter, giving rise to galaxies in the centers of dark matter halos. For the past 20 years, however, efforts to reproduce this process in computer simulations have failed to generate massive disk galaxies that look anything like the Milky Way, with its spiral arms in a large flat disk around a small central bulge made up of old stars. A realistic simulation of star formation was the key to Eris's success, Madau said. "Star formation in real galaxies occurs in a clustered fashion, and to reproduce that out of a cosmological simulation is hard," Madau said. "This is the first simulation that is able to resolve the high-density clouds of gas where star formation occurs, and the result is a Milky Way type of galaxy with a small bulge and a big disk. It shows that the cold dark matter scenario, where dark matter provides the scaffolding for galaxy formation, is able to generate realistic disk-dominated galaxies." 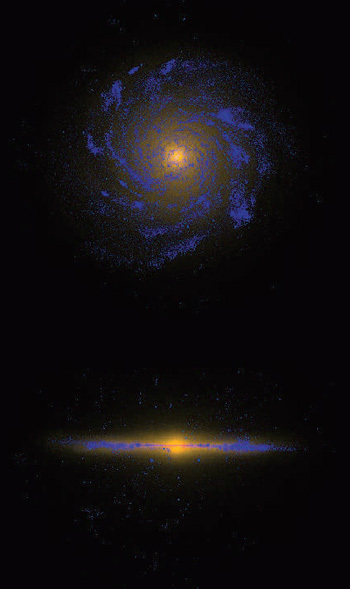 To perform the Eris simulation, the researchers began with a low-resolution simulation of dark matter evolving to form the haloes that host present-day galaxies. 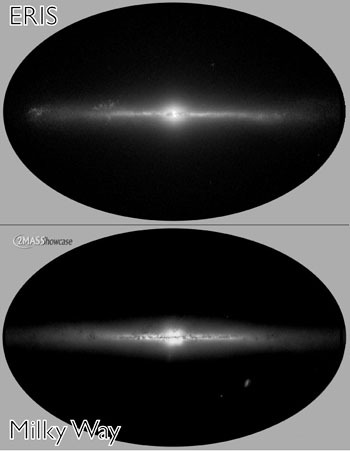 Then they chose a halo with an appropriate mass and merger history to host a galaxy like the Milky Way and "rewound the tape" back to the initial conditions. Zooming in on the small region that evolved into the chosen halo, they added gas particles and greatly increased the resolution of the simulation. High resolution means tracking the interactions of a huge number of particles. "The simulation follows the interactions of more than 60 million particles of dark matter and gas. A lot of physics goes into the code--gravity and hydrodynamics, star formation and supernova explosions--and this is the highest resolution cosmological simulation ever done this way," said Guedes, who is currently a postdoctoral researcher at the Swiss Federal Institute of Technology in Zurich (ETH Zurich). The high resolution allowed for a more precise recipe for star formation. In a low-resolution simulation, with gas densities averaged out over relatively large areas, the threshold density for star formation has to be set so low that stars tend to form in diffuse gas throughout the galaxy. In the Eris simulation, the star-formation threshold allowed stars to form only in high-density regions, resulting in a more realistic distribution of stars. An important consequence is that when stars explode as supernovae within these localized, high-density regions, the energy injected into the interstellar medium blows a lot of gas out of the galaxy. "Supernovae produce outflows of gas from the inner part of the galaxy where it would otherwise form more stars and make a large bulge," Madau said. "Clustered star formation and energy injection from supernovae are making the difference in this simulation." In addition to Madau and Guedes, the coauthors of the paper are Simone Callegari and Lucio Mayer of the Institute for Theoretical Physics in Zurich. This research was funded by NASA, the U.S. National Science Foundation, the Swiss National Science Foundation, and an ARCS Foundation fellowship to Guedes.